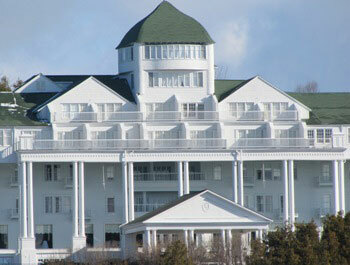 In its rich 124-year history, the award-winning Grand Hotel on Michigan's Mackinac Island has hosted over five million vacationers from around the globe, all seeking an idyllic escape amidst the picturesque setting of the Straits of Mackinac separating Michigan's upper and lower peninsulas. Several U.S. presidents, foreign dignitaries, celebrities, special events too numerous to count and even two Hollywood films are all a part of Grand Hotel's impressive resume. With 385 unique guest rooms, abundant sitting areas, a massive dining room and the world's longest front porch at 660 feet, Grand Hotel is the largest summertime-only resort in the world. It's also a National Historic Landmark and it resides within Mackinac Island State Park—the oldest state park in the nation. 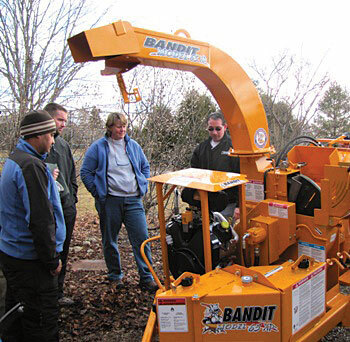 So when Bandit got a call from the hotel about acquiring a new Model 65XP hand-fed disc chipper to help maintain their grounds, we weren't just excited, we were honored. "I'd checked out a lot of chippers and for what we needed, this one fit everything," said Mary Stancik, superintendent of grounds and golf for the hotel. She initially spotted Bandit at the Great Lakes Trade Expo in Grand Rapids, Michigan while researching various models to replace the hotel's worn out, 20-year old chipper. After checking out the other manufacturers, she decided Bandit was the way to go. The only question she needed to answer was which size machine would best suit the situation. "I picked up all the literature for the other sizes but I knew we didn't need anything big," explained Stancik. "Material larger than six inches is used for firewood, so it didn't really make much sense to go for a chipper bigger than that. We talked with Bandit about what we needed and the Model 65 worked out to be the best." Material size wasn't the only determining factor in choosing the Model 65XP. Grand Hotel's property spans 200 acres of lush gardens, walking paths, an 18-hole golf course, a statuesque tea garden and more, but working space for a chipper is actually quite limited. The Model 65XP's compact size along with its efficient production and six-inch capacity made it the ideal machine for maneuvering around the hotel's delicate grounds. "Our old chipper was just a beast of a machine; we could barely turn it around," she said. "We're limited for space so physical size was a key factor. The size, the performance; the 65 was just the right machine for what we needed." Grand Hotel took delivery of their Model 65XP at the end of March, riding to the island on one of the first ferry runs of the season. Bandit's exceptional reputation for reliability and dependability was immediately put to the test, as Mary and her chipper crew of approximately 3-4 specialists can only run the 65 a few weeks in the spring and fall due to noise. Mackinac Island is unique in that motorized machinery isn't permitted, save for emergency vehicles and specialty equipment like the chipper. Once guests and tourists are on the grounds, even the noise of a small chainsaw can reverberate mercilessly throughout the area, significantly affecting the otherwise tranquil surroundings. The noise also tends to disturb Mackinac Island's generous population of horses, which help transport the million-plus visitors around the island each summer. "Right now we only have this bit here to chip," said Stancik, pointing to a pile of limbs and small trees in a clearing between the hotel and the shoreline. "We try to start the spring fresh with nothing to be chipped, but when we go around for our spring cleanup, we usually find some trees or branches down. We probably won't run it more than 20, maybe 24 hours in the spring then moreso in the fall, so we can get rid of the stuff we stockpile over the summer. But once we get people onto the island, because of the noise we just can't use anything loud." Mary said the chips are used primarily to cover the hotel's half-mile long Vita Course—a woodchip path with numerous exercise stations meandering through the trees at the base of the hotel. Chips are also used in areas around the hotel's golf course, but the trail gets a fresh coat of chips each spring. Walking along the path with Mary, she points out a portion of the approximately 15,000 daffodils planted in the fall. Flowers and gardens cover approximately 50 acres of the Grand Hotel's grounds, though in early April the area retains the gray stillness of winter. "Only a few places downtown stay open, a few little inns that are open year around," said Stancik. "We do an early opening with one wing of the hotel later in April, but our season is May through October. Right now the roads are still dirty and none of the stores are open, but by the beginning of May the place just transforms. It's pristine clean and vibrant; it's amazing to see." While visiting the hotel to assist with the startup of their new chipper, Mary further honored Bandit by graciously providing a personalized tour of Grand Hotel, giving us a special opportunity to witness part of this transformation in progress. Despite the silent air and pale white covers hiding furniture and fixtures, the regal atmosphere of the hotel was breathtaking. Standing in the hotel's massive Victorian-style dining room overlooking the Straits of Mackinac, Mary described a bit of that atmosphere as only a member of the Grand Hotel staff could. "The night before the main opening we have a mandatory staff meeting in here. There's probably a little over 500 of us; we all have to be in our uniforms and it's really neat because the servers wear tuxes with tails, and since we have our own stables the carriage drivers are all here with their top hats and black riding boots. It's just really cool to be here, to see each group all dressed up."